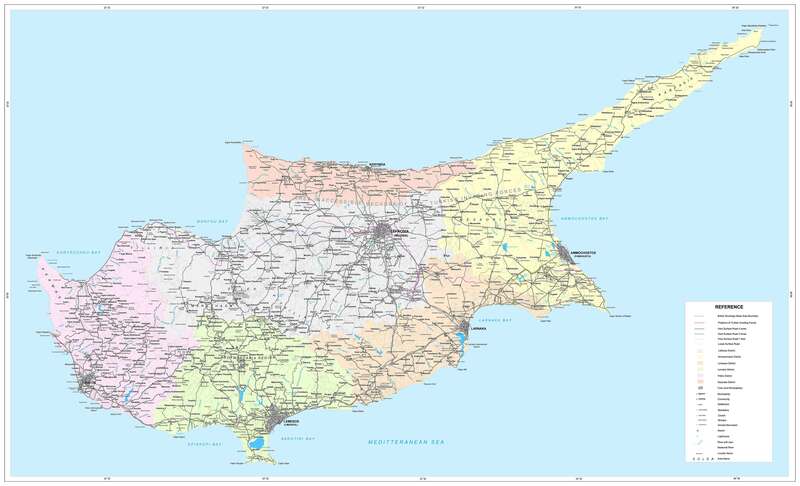 If you are looking for an excellent folding road map of Cyprus then we unreservedly recommend the Cyprus Insight Travel Map which has detailed road maps as well as street maps for the major cities. The Maps of Cyprus website features large, high quality road maps and street maps of various districts, towns and villages in Cyprus. 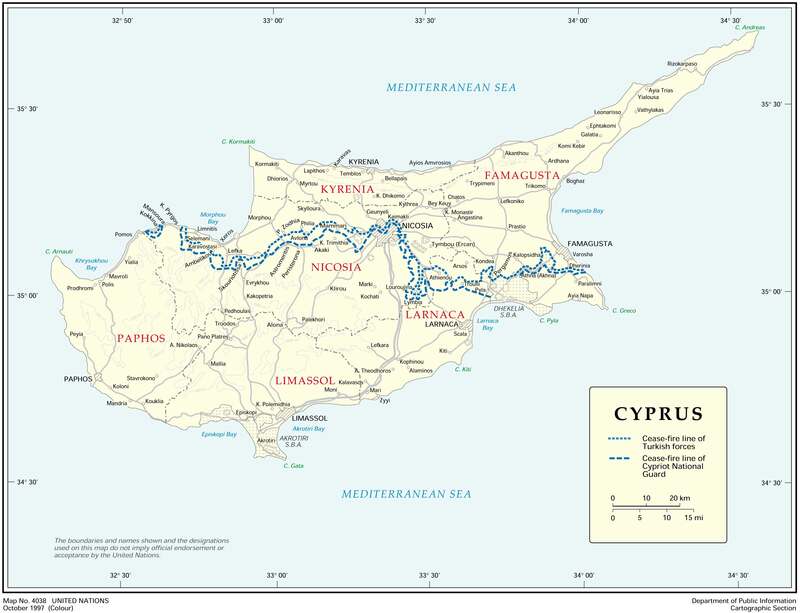 Cyprus today offers a truly exotic mix of European culture and ancient mystique. Its varied landscape combines alluring beaches and mountain peaks; villages are surrounded by vineyards and olive groves; countless ancient ruins to inspire and stir the imagination. State of the art marinas at Paphos and Limassol and two new international airports planned mean that Cyprus is fast becoming a recognised hot spot in property investment and an ideal holiday destination. Kato Paphos Archaeological Park, Paphos. Tombs of the Kings, Kato Paphos, Paphos. Alpha Divers Dive Centre, Larnaca. Archbishop Makarios III Cultural Foundation, Nicosia. Fine white sand and clear water, it is lovely to bathe in Cyprus. Note that a red flag means bathing is forbidden, a yellow flag means that bathing is at your own risk while a green flag means go ahead. 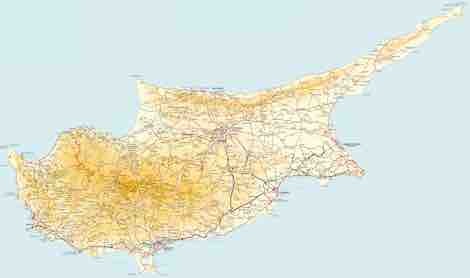 There are more than 50 Blue Flag beaches in Cyprus. 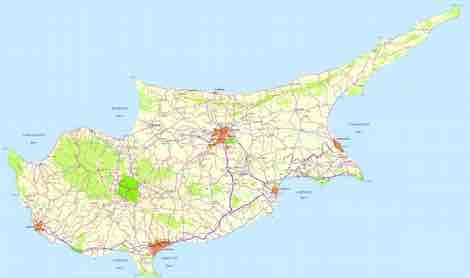 Voted the best place in the world for investment in property, the appeal and accessibility of Cyprus is growing all the time. Numerous developments are currently underway around Larnaca. Paphos is probably the best known city in Cyprus, however Larnaca is the oldest living city in Cyprus and is well located with the local international airport just 10km away. Investment property in this area ranges from huge luxury resorts with extensive recreational and sporting facilities, including PGA golf courses, to sympathetic smaller scale communities within traditional living villages. The Greek lifestyle has influenced Cyprus' cuisine with sheftalia, which are barbequed sausages A typical local dish is grilled halloumi cheese, often with watermelon. Other popular dishes include patates yiahni and moussaka. A very popular pasta dish is pastichio, a Greek style lasagna. A delicious taverna style meal is revithia, chickpeas baked with onions in olive oil and flavoured with rosemary and lemoin juice. One of the most popular fast foods is souvlaki, small pieces of meat and sometimes vegetables, grilled or barbequed on a skewer. Breakfast is often a simple meal consisting of olives, juicy tomatoes and baby cucumbers. It can also include fried or grilled halloumi, eggs and lountza (Cypriot bacon/sausage) with delicious fresh crunchy sesame-seed covered bread called koulouri. Anari (a soft white cheese) or yogurt with fresh fruit drizzled with honey are also very popular breakfast meals.